I just uploaded a new version of the XRDS extension for Firefox and a version of the openinfocard extension that uses it. When the extension xrds_pageinfo.xpi is installed then the openinfocard extension shows the list of cards that where used at this site. Hm, to be more precise: The list of Information Cards is shown of which a record of usage is stored in the cardstore. If you use the new "delete privacy data" feature of the openinfocard extension then no card usage is shown. Also available in other languages than German. Sometimes things actually move forward. Based on the discussion at IIW and the former posts I started to write an extension for Firefox that allows users to see the XRDS provided by a site. I see this as a further step to get IDentity In the Browser. But not only "openid in the browser" but much more. First let's see how this looks. Even if you have this new "xrds_pageinfo.xpi" extension installed and visit a site that provides xrds then there is at first not much to see. The site's XRDS is not visible to the user. And that is good as it is. The normal user is not interested in some xml file. The services described in the file matter. This interface definition will change. But after I have integrated this into the openinfocard identity selector and after feedback from the other XRD-enthusiasts and perhaps integration into "openid in the browser" I expect something stable no so far away. 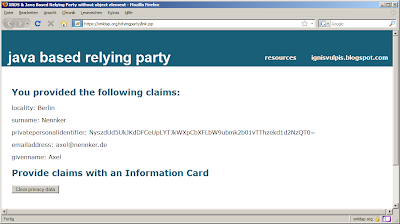 click and the Information Card selector starts and your chosen claims will be send to the RP. click and your openid attributes are retrieved and provided (without stealable credentials being involved). click and the browser opens the page where you can edit your data. click and the browser opens the page that lets you terminate the relation to this site. 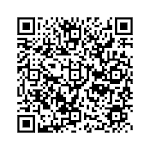 click and you can present your voucher. click and you are a new customer with verified claims. There are many open questions. Implementing this and defining service types etc is fruitless if there is no (industry) standard. I hope that I can work in the OASIS TC(s) relevant to this. Currently it looks like joining is next to impossible. I spare you the details. Join veteran Experts Conference speaker Pam Dingle as she shares tips and tricks on how to achieve 'enlightened bottom-up' Identity Management. Pam believes that, as long as you start with a few simple overarching strategic principles, identity management can be 90% tactical. Pamela will use her professional IdM experience to show how the right selection of point solutions in the enterprise can make a world of difference, providing strategic agility to the business while pre-emptively reducing complexity for the future. Look for ILM, Federation and CardSpace to be key technology players in this talk, complete with real-life examples that tie it all together. The Experts Conference, March 22-25, 2009 in Las Vegas, NV presents her talk "The Survivalists Guide to Identity Management". I got a new computer and tried the openinfocard id selector with it; but Boom the Java code did not run. Hm, I forgot to install a new version. Preinstalled was some Java 1.4 version... I installed Java 1.6 update 10 and tried again, but again it failed. Ahh, the new java plugin for Firefox hit me again. I had to set HKEY_LOCAL_MACHINE\SOFTWARE\JavaSoft\Java Plug-in\1.6.0_10\UseNewJavaPlugin from 1 to 0 to disable the new plugin. After that the openinfocard selector worked again. Another bug in the new plugin is that it does not implement the instanceof operator for Java objects. For this bug there is not even a promise to fix it... Well, thank you SUN for making my life interesting; NOT. Is it only me who finds it anoying that Microsoft over and over again produces example pages that have very very illegal (X)HTML code? The example page for the Information Card Tile has yet several errors that occure when one uses a framework to create HTML pages that simply does not work well. 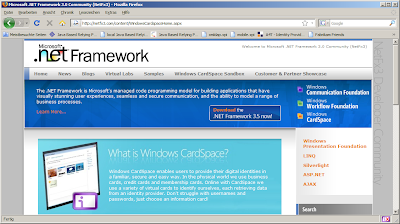 One should think that Microsoft's programmers have access to tools that produce valid code?! Or maybe all the Micorsoft tools and frameworks are so that they produce invalid code when you include one page into another? Bad example. Although I like the Information Card Tile. Even though I would implement it in another way. Some time ago I came up with the same idea but did not implement it because that would have been "not standard". Well, now it seems we witness the birth of a new standard. I would implement the Information Card Tile á la microformats by using the class attribute. I would add a special class to the HTML-image tag to denote a tile. The selector would then overwrite the src-attribute when the card with the PPID "the-ppid" exists and add an onclick-handler that starts the selector or sends the card if the user has chosen to always use this card. We will have a session this morning about XRDS and OpenId and Information Cards. The IIW2008b wiki has an initial page about this topic. Please come and let us define something useful. The current version of the openinfocard identity selector now uses the same browser add-on code as DigitalMe (revision 2525 of IdentitySelector.js). Although there are some additional features like the status-bar icon and the XRDS support. 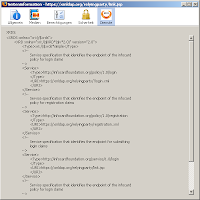 The XMLDAP relying party is now updated to provide XRDS data. Notice the Information Card icon in the lower right corner in the status-bar of the browser. You can start the card selector either through the sidebar - by dragging a card to the main window - or by clicking the Information Card icon. 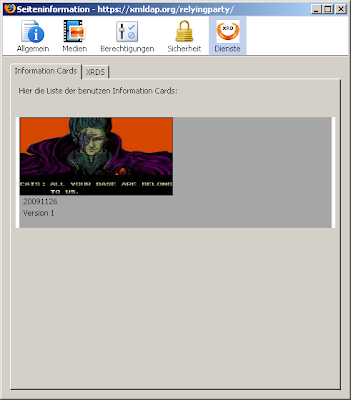 You need the latest version of the openinfocard id selector. You may be wondering what the difference between the next and the previous image is? 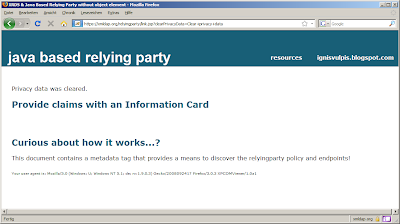 I created a second card and used it at the xmldap relying party too. The new claims were added to the previous set of claims. The claim "locality == Berlin" is new. This image shows that the claim set was cleared. 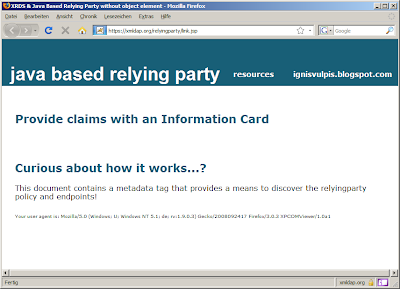 The relyingparty party has forgotten the privacy data after the "Clear privacy data" button was pressed. THIS IS THE USER EXPERIENCE YOU WANT. DEATH TO USERNAME/PASSWORD. Please note the small Information Card icon in the status-bar in the lower-right corner of the browser window. If no Information Cards are accepted by the site then the icon has a little red cross. If Information Cards are accepted by the site then the Information Card icon is shown. You can click on the icon to start the identity selector. In former posts in this blog I stated that I find the use of the HTML object element for Information Cards "not optimal". The main reason is that the object element is intended to provide a means to render media like Flash, PDF, videos, sound etc. The second reason is that Mozilla requires that object elements are handled by a plugin instead of add-ons (and plugins are platform dependant). In other posts I described a way to use XRDS to eliminate the object element. Now, finally, I found some time to implement this in the openinfocard information card selector and the xmldap relying party. First, here is how this looks. The user surfs to the relying party. 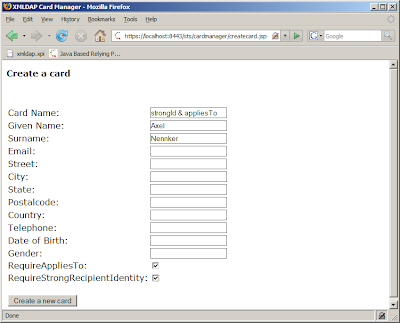 She opens the card selector in the browser's sidebar (Crtl-Shift-i). She drags a card onto the main window and the card selector starts. 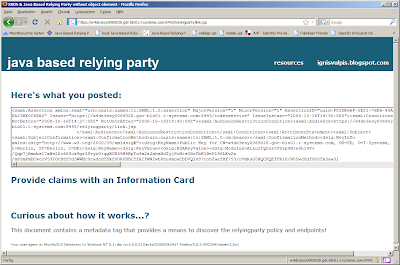 The relying party now shows the posted token. 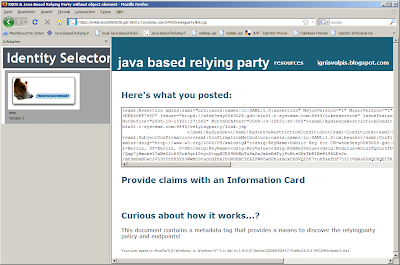 Detecting the presence of the selector and acting appropriately is not that easy for a relying party. Now this task is simply not there. No more hiding of the missing plugin warning. 1) The relying party HTML contains a HTML-Link element that points to a xrds file that is retrieved by the openinfocard Firefox add-on. In this example the href is a URL relative to the current document but the href can be absolute too. 2) The openinfocard add-on retrieves the xrds.metadata document. 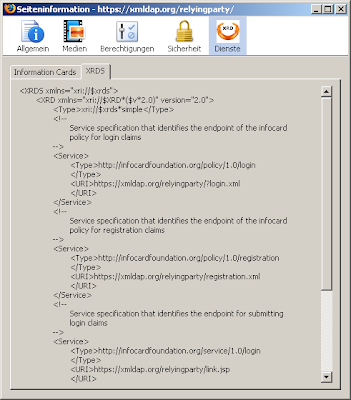 2) The openinfocard add-on retrieves the document for the service of type "http://infocardfoundation.org/policy/1.0/login". 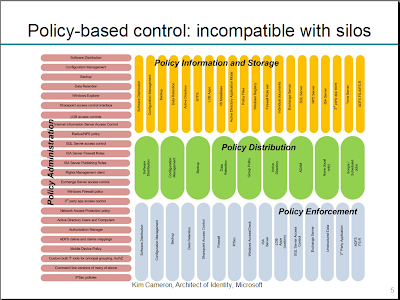 Instead of the object I could have used a relying party issuerPolicy document but I wanted to keeps things simple. 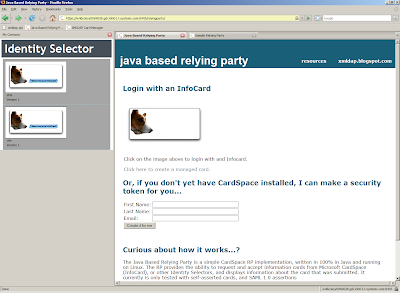 5) The security token from the card selector is posted to the service of xrds type "http://infocardfoundation.org/service/1.0/login". 6) The relying party interprets the token and returns nothing. 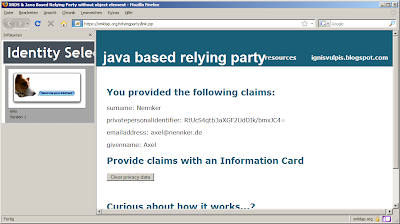 8) The relying party can show the the claims to the user or whatever it thinks it is appropriate with the new claims information (e.g. new payment options). This morning I found an advertisment for next week's Web 2.0. Expo Europe in my daily newspaper. I find it interessting that the organizers find it money well spend to have an ad in a "normal" newspaper. A quarter of the first page of the business section costs probably some money. I will not attend the conference but will probably visit the expo. Although I would like to go to the conference too. There are some interesting talks and session. My brazen request for a blogger/press pass was rightly declined. 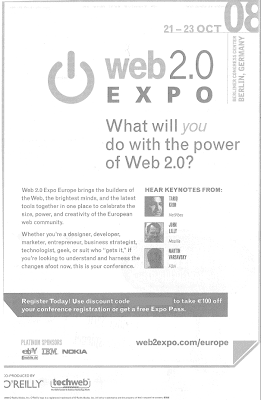 See you at the Web 2.0 Summit in November and of course the Internet Identity Workshop 2008b. This is a nice combination. Meet me there. Suggestions for the weekend?! Just filed a bug for Firefox 3 and Java 6 Update 10 RC. 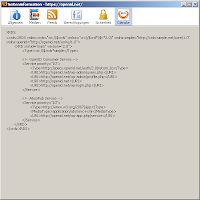 I maintain the Firefox extension "openinfocard"
This works with previous version of java. 1. Install the Firefox extension into FF3. Save to disk, then install. 2. navigate to a site that uses Information Cards e.g. The tag for this event is iiw2008b. I for me don't have financing to attend (yet) but I recommend this event. Be there! Vittorio wrote about issue #16 of the Microsoft Architecture Journal. The latest edition is all about Identity, Claims etc. 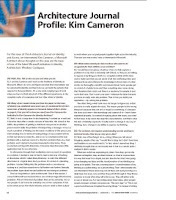 And it contains an interview with the master, Kim Cameron, who mentions the Information Card Foundation as an example of the industry coming together to make this all happen. Please make sure that you always use the latest version of the xmldap.jar (if you have an RP or STS that needs it) and xmldap.xpi (the id selector). In April I committed a version of the RP (xmldap.jar) to the svn repository that did not work with DigitalMe. I apologize for that. Here is another post for today in the series (1,2,3) of posts around things you always wanted to know about Information Cards but never had the heart to ask. 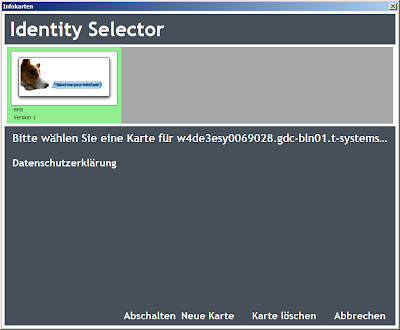 Did you know that CardSpace does not use the Identity information in an identity enabled EndpointReference? Shocking. When you import a managed card from a .crd file there is something inside the file that is called the TokenServiceList that contains a sequence of TokenService(s) that contain an EndpointReference. This is defined in WS-Addressing and in our case extended to contain an element "Identity" from the namespace "http://schemas.xmlsoap.org/ws/2006/02/addressingidentity". Can you imagine: CardSpace just throws away this certificate and never uses it! What is this certificate anyway? Some clever people came up with the idea that EndpointReferences need more security and should be protected by Identity. One way to provide endpoint identity information is to specify which certificate will be used by the (security token issuer) endpoint. This for the theory; in practice CardSpace does not use this information. Microsoft thinks, I guess, that in general people - even professionals - are to stupid to handle the crypto-thingy correcly. I don't know. I think that we should expect an Identity Provider to know its business and part of that business is to handle the certificates/keypairs etc so that the Identity Metasystems handles a renewed certificate without hickups. 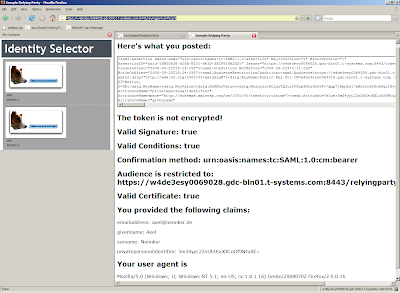 An alternative to specifing a certificate is to specify an RsaPublicKey. This has no validity dates attached to it so it can not become invalid. If the STS specifies the public key then it can change certificates or part of the information in the certificate as long as the keypair stays the same. This advantage of keypairs in contrast to certificates is an disadvantage too. Should the private key of the keypair be compromised then all information cards have to be re-issued (Super-GAU). Well, this falls in the category "This should never happen". We should expect to see this not too often. Enough gossip for now. Time to call it a day. Copyright © 2006-2007 Microsoft Corporation, Inc. All rights reserved.